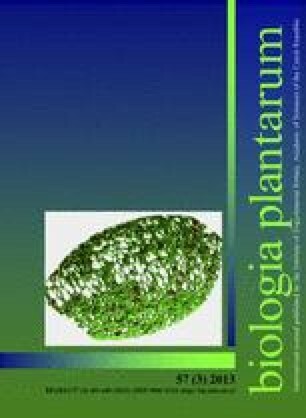 The effects of Cu2+, Zn2+, Cd2+ and Pb2+ on growth and the biochemical characteristics of photosynthesis were more expressed in barley (Hordeum vulgare L.) than in maize (Zea mays L.) seedlings. The barley and maize seedlings exhibited retardation in shoot and root growth after exposure of Cu2+, Cd2+ and Pb2+. The Zn2+ions practically did not influence these characteristics. The total protein content of barley and maize roots declined with an increase in heavy metal ion concentrations. The protein content of barley shoots was only slighly decreased with an increase in heavy metal ion concentrations, but the protein content in maize shoots was increased under the same conditions. The chlorophyll content was decreased in barley shoots and increased in maize. The ribulose-l,5-bisphosphate carboxylase (RuBPC, EC 4.1.1.39) and phosphoenolpyruvate carboxylase (PEPC, EC 4.1.1.31) activities were decreased drastically by Cu2+, Cd2+ and Pb2+ in thein vivo experiments. The tested heavy metal ions affect photosynthesis probably mainly by inhibition of these key carboxylating enzymes: this mechanism was studied in thein vitro experiments.